Calibration and cleaning is important to getting the pH and strength of a nutrient solution correct and in turn, essential for hydroponic growing. Probe cleaner, buffer and conductivity standard help get the best out of your pH instruments. Ideal for lengthening the life of the pH probe. Growth Technology pH Probe Cleaner does exactly what it says on the label as it cleans salt deposit residues left by nutrients solutions when measuring the pH. 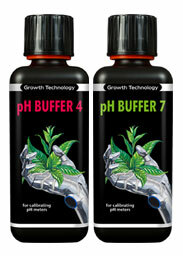 The Growth Technology pH buffer solutions are each of a known and fixed pH - 4 and 7 respectively. These can be used to check and calibrate your pH meter. Conductivity Standard by Growth Technology has an electrical conductivity (EC) of 2.76 ms/cm ensuring that your EC/CF meter is calibrated and that it gives the correct reading when mixing nutrient solutions. Bluelab Conductivity Probe Care kit to keep EC meter probes clean and accurate. If dirty or contaminated, it will more than likely give an inaccurate reading, meaning your nutrient solution will not be at the optimum for healthy growth and flowering. This large LCD display digital thermometer / hydrometer simultaneously reads and displays temperature, in both Celsius and Fahrenheit, along with the humidity as a percentage.